I'll take one of the guesses out of the equation though - it's not the additional Copic markers we are all waiting for. I am hoping that these will arrive this next week as well, but I have been hoping that for a LONG time now and therefore I am no longer holding my breath for fear of fainting - LOL! Masking and airbrushing - what a cool combination this is! I have fallen in love with creating some of my own background papers by combining masking, airbrushing and stamping. In creating this card I made a couple of discoveries that have nothing to do with masking though. 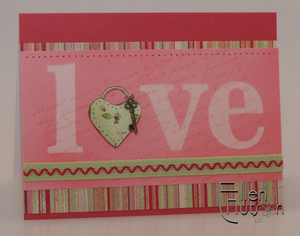 The first is that the Urban Couture ribbon line looks fabulous with the Memory Box Enlighten paper series. Secondly, I discovered that it is fun to color over patterned paper with Copic markers. I stamped the Lock Heart on patterned paper so that it would tie the color scheme together, but realized that some of the detail disappeared in to the pattern. By highlighting the special features of the stamp with just a light touch of marker it emphasized them just enough to bring those details to the forefront. The little key is made by Jolee - I picked some up to put in the store, but of course they aren't up yet - LOL! Could I please have just a little more time in my day, so that I could get all these things done? Of course I forgot to take pictures of the background as I created it and so I needed to recreate the key steps to share with you for the pictures below. 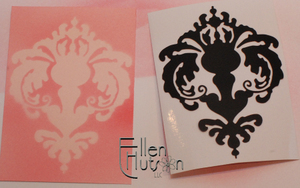 For the card above I used the Newsprint alphabet and for the examples below I used the Damask mask. The first thing I would like to remind you to do is to lightly tap your finger tips over the entire sticky surface of the mask before adhering it to your project. This is important being that the masks are SO sticky they might pull your paper surface off if you attach them directly to your project first. Be certain not to overdue this step though being you want it to still stick to your project. Lightly stick the mask on to your paper by pressing it down gently all over. I then selected a pink Copic marker in a darker value of the pink color and airbrushed over the entire piece. Upon completion remove the mask and adhere it back to it's "plastic-like" surface so that you can reuse it for your next project. Also don't try taking pictures with your right hand as you spray with your left simultaneously, or you will get a "hot-spot" like I did as shown above - LOL! If you do not own an airbrush please do not hesitate to try this technique. Instead what you will do is select an ink pad that is a slightly darker value of the color of cardstock you have selected. 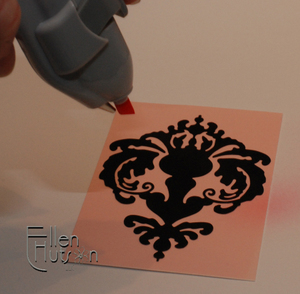 Then using the Ink Blending Tool pick up color from the ink pad and smudge and smooth it over the entire surface with a smooth motion. The results are slightly more mottled, but this is a fun effect as well. I finished the project off by using the Spanish Script backgrounder from CHF, a little piercing, ribbon and accent paper. Another idea that you could spin off of this project would be to write out the sentiment "i heart u" (using the Lock Heart as the heart). What other ideas do you have that you would like to share? Well put your thinking caps on and get ready - what do you think it is that I have fallen in love with this time? I can hardly wait to share our exciting news! It should be the backgrounder stamps from CHF. Now, those rock! Hmmmm chipboard? The new Grunge hammer tool? Rub-ons? Tins of all shapes and sizes? My guess is either a sewing machine, or clear Lockhart stamps. It's got to be the masking paper - by Eclipse...because I just bought it,,,and I'm betting you will carry it now..right? I sooo love your creativity!! well, it's gotta be distress inks and/or heidi swap masks. i have both and i totally 'get' why you would fall in love with them! ahh, i could look at your beautiful work all day. so, you are moving to Connecticut to give classes when? my guess is the masks. Beautiful card. thanks so much for sharing! Beautiful card!! I love the little lock and key!! Hmmmm to guess, I'm thinking the line of Distressing inks. I bought the Antique Linen (at my local store) when I purchased Debbie's bracelet kit, and that stuff ROCKS! I'm brain dead, but you've got me curious, now! Can't wait till Monday. It's gotta be the Heidi Swapp masks! They are just too cool! I think it's the masks and the Ink Blending Tool! Would it be the Heidi Swapp masks?? Oh, I hope it's the masks! How wonderful! My guess is the ink AND the masks!! Who doesn't love the masking patterns (?) that are out there! What a cute and clever card! 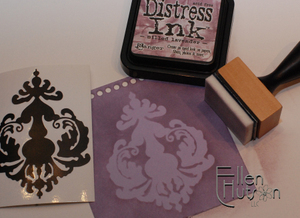 Can't wait to see what the new product is... my guess will be Tim Holtz Distress ink (which is awesome)!